Below is an image of one of the new Sarah Hardaker fabrics made up into a roman blind - the fabric is Majolica in Fudge which is £46/m. 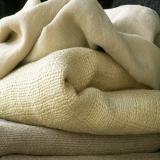 A gorgeous chunky linen. The second image shows the range of colours (fudge is at the bottom).